On 12 February, 2013, the CAA Events Subcommittee organized a behind-the-scenes tour of the Chicago History Museum archives. CHM Archivist, Peter Alter, took time out of his busy schedule to provide a short history of the museum (formerly known as the Chicago Historical Society) and its current collecting policy. He then led a tour down to the closed-to-the-public basement where the collections are held. The tour included an examination of a few items pulled by Alter that highlight the collecting strengths of the museum. Alter emphasized the impact late Archie Motley had on the growth of collections, and the way that impact influences the growth of collections today. Finally, Alter answered a few questions about CHM's holdings and access to the collections. Chicago Area Archivists would like to thank Peter Alter for being so generous with his time. This was a popular repository tour, so Peter has graciously offered to lead another in early May. Watch the CAA website and the listserv for an announcement with more details. Did you know? You can follow updates to Events on the CAA website via RSS feed. If you are unfamiliar with RSS feed managers, Google Reader is a free, easy to use option. This video tutorial is a quick introduction. Register for the next CAA sponsored SAA Digital Archives Specialist (DAS) webinar at any one of the following 4 convenient locations on March 20th, 21st and 22nd. Register online now! Space is limited to 20 participants at each webinar, so register quickly with convenient payment by credit card for the location and date of your choice. NOTE: For those webinar participants who wish to pursue DAS certification and to take the online exam after the webinar, SAA will charge a separate exam fee of $35. Interested in More Digital Archives Specialist Webinars? Can't make the March webinars? “Information Architecture” is the next scheduled Web seminar to be offered in Spring 2013. Check in and stay tuned! This webinar is sponsored by the Chicago Area Archivists (CAA). CAA is offering a series of webinars from the Society of American Archivists’ Digital Archives Specialist curriculum. “Commerce in Human Souls” presents historic letters, diaries, ledgers, and drawings to tell the dark story of the Atlantic slave trade. On display are rare 18th and 19th century documents that dramatically represent a vast, 300-year long international enterprise that shaped many of the economic, political, racia,l and social beginnings of our contemporary world. The exhibit is the result of a collaboration between Nancy Cirillo, Valerie Ann Harris, Peggy Glowacki, and many others. Drawing on UIC’s Atlantic Slave Trade Collection, Sierra Leone Collection, and Carberry Collection of Caribbean Studies, they created an exhibit that demonstrates how the Atlantic slave trade fueled the economies of most of the western European nations and their colonies in the New World. “Commerce of Human Souls: The legacy of the Atlantic Slave Trade” is on display through 31 May 2013 at UIC’s Richard J. Daley Library, Special Collections and University Archives. Library hours and information are available at http://library.uic.edu/home/collections/manuscripts-and-rare-books. CAA Members will need to be logged into the website to access the Forum. Click "Forgot password" if you do not remember your login information and a message will be sent to the email we have on file via your member registration information. Stay tuned for RSVP information for the CAA Members Meeting on Tuesday, March 19th from 5:30pm to 7:30pm at DePaul University, John T. Richardson Library, Room 400, 2350 N. Kenmore Avenue. Do you like learning about Chicago history? Would you enjoy supporting motivated students that want to share their exhibits, performances, websites, documentaries, or papers with you? Each year, Chicago Metro History Fair students in grades 6-12 select a topic related to Chicago history, then dive deep into research to develop their own interpretation or argument which they then present for evaluation by community-minded judges. Through this research and evaluation process, students gain skills and knowledge that will carry them through high school and prep them for college work. Please consider volunteering as a History Fair judge this year. Many CAA members (and non-members) have volunteered in the past and found it to be a very rewarding experience. There are several evening and weekend judging opportunities in March and April. No prior experience is necessary. The Chicago Metro History Education Center provides orientation on the day of the event and pairs new judges with veteran judges. For more information and to volunteer, visit the History Fair website. Historic photos of the Union League Club of Chicago were featured in the December issue of Sciprophily, the Journal of the International Bond & Share Society. This past fall, the journal contacted Union League Club archivist Anita Mechler about a photo it found on eBay. In response, Mechler provided the journal with information about one of her favorite pieces of ULCC historical lore: the Million Dollar Room. 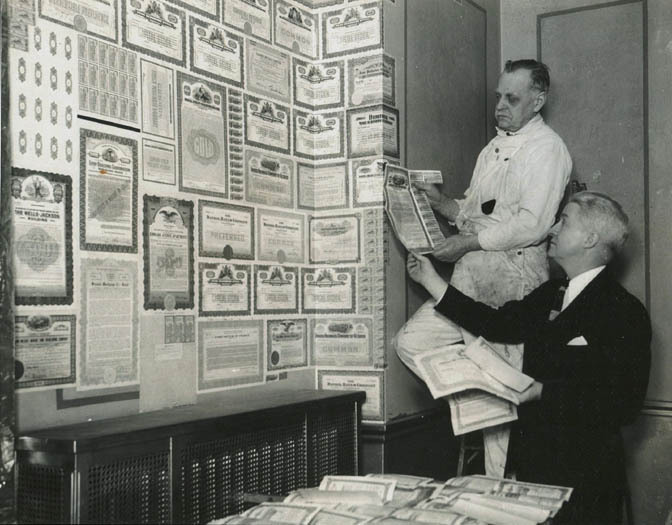 This room was wallpapered by member’s “useless” stocks and bonds in 1934. The name was derived from the value of the items before the stock market crash of 1929 and further decline of the market in 1932 and 1933. 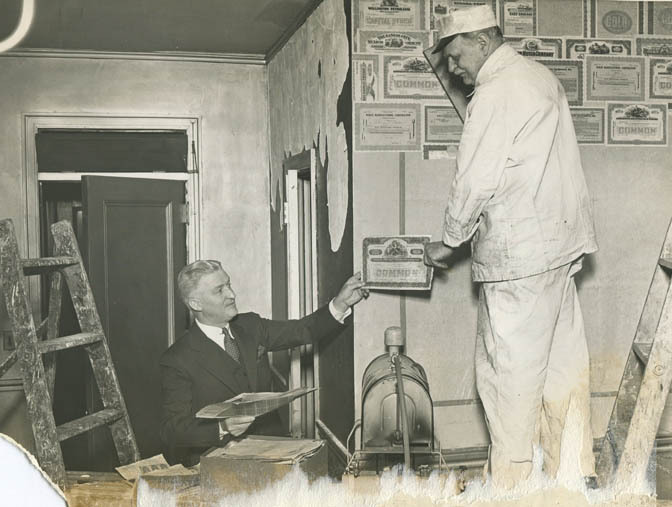 The room was decommissioned in 1936 when members decided to see if their “wallpaper” was worth anything after the economy briefly recovered. The result was an article featuring these historic photos from the Union League Club’s archives. All images Courtesy of the Union League Club of Chicago. 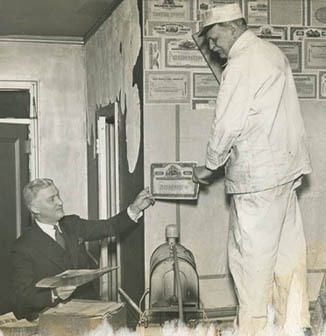 Top: Union League Club of Chicago member Harry Dougherty and a workman named Jake hang "wallpaper" in the Million Dollar Room. 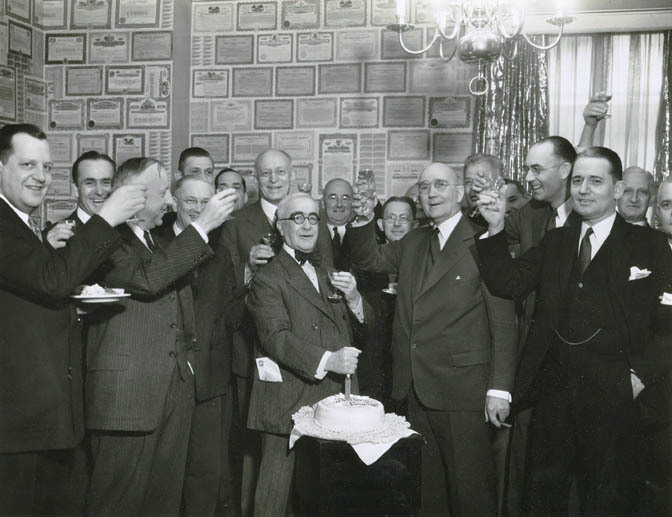 Middle: The first meeting of Union League Club members in the Million Dollar Room, May 1934. Bottom: The Million Dollar Room undergoes transformation to the Gold Room, May 1936. All images Courtesy of the Union League Club of Chicago. The minutes of the November 13 and December 6 meetings of the CAA Steering Committee have been approved and are available to view online here. If you have questions about the Steering Committee's activities, or any other CAA business, please contact us at info@chicagoarchivists.org. A star on both the stage and screen, Northwestern alumna Patricia Neal was best known for her film roles in The Day the Earth Stood Still (1951), Breakfast at Tiffany’s (1961), and Hud (1963), for which she won the Academy Award for Best Actress. A new exhibit at Northwestern University Library explores her legacy, based on the extraordinary collection of personal papers, Hollywood souvenirs, photos, and other memorabilia now held by the Northwestern University Archives. Curated by Benn Joseph, Manuscript Librarian for Special Collections and Archives, the exhibit is packed with artifacts from Neal’s childhood, school life, career, family, legacy, philanthropy and celebrity. Among them are a baby book with a lock of Neal’s hair; intimate letters from Gary Cooper, whom she met while starring with him in The Fountainhead; and her Academy Awards tickets from 1964, the year she was nominated for best actress. Her marriage to Roald Dahl, the celebrated author of Charlie and the Chocolate Factory and other beloved children’s books, is chronicled in photographs of Dahl and their five children; a letter Neal wrote about Dahl’s work on James and the Giant Peach; and a profile Dahl wrote for Ladies Home Journal about Neal’s struggle to recover after her stroke. And there are letters from friends and colleagues including Paul Newman, Gene Kelly, Ronald Reagan, Anne Bancroft, Kirk Douglas, and Andy Griffith. Northwestern University Library is located at 1970 Campus Drive on Northwestern’s Evanston Campus. The exhibit is free and open to the public through 22 March 2013 during the library’s regular public hours: Monday–Friday, 8:30 AM–5:00 PM and Saturday, 8:30 AM–12:00 PM. Four positions on the Steering Committee of two year terms beginning in March 2013 and ending March 2015 are open. Candidates will be elected by a vote of CAA members at the Annual Meeting on Tuesday, March 19th. Service on the Steering Committee is open to all CAA members in good standing, anyone with an interest in the profession, from students to retirees, professionals and paraprofessionals in all types of archival repositories. Qualifications include enthusiasm, initiative, and a commitment to the profession. Interested CAA members should submit a brief (1-2 paragraph) Statement of Interest that will be distributed in advance of the Annual Meeting to inform the voters about your background and motivation for serving on the Steering Committee. Send the Statement of Interest to info@chicagoarchivists.org and be sure to include your full name, title and place of work if applicable, and preferred contact phone and email address. The Deadline to submit your Statement is Monday, February 11th at 5pm. CAA members to serve on the Steering CommitteeTerms for four members of the Steering Committee are ending in March 2013. Vote for CAA members who will serve a two year term (March 2013-March 2015). Candidates’ Statements of Interests will be shared with CAA members by February 19th, one month prior to the Annual Members Meeting. Changes to the by-lawsIf approved these changes would take effect at the close of the 2013 Members Meeting. The CAA Steering Committee proposes the following changes to the by-laws. The changes are all in reference to expanding the members’ ability to vote. Currently, voting can only be done in person at the Annual Meeting. Our new membership software opens up the possibility for online voting, so we propose to change the by-laws to take advantage of options other than voting in person into account. The last dues increase CAA members experienced was in 2004 when dues were raised from $5.00 to $10.00. The Steering Committee is proposing to increase dues to $15.00 as we have begun to incur the following regular monthly and annual expenses: bank account fees, Wild Apricot Membership Software/Website fees, and State of Illinois annual report filing fees. If approved this change will be take effect with payment of 2014 dues.